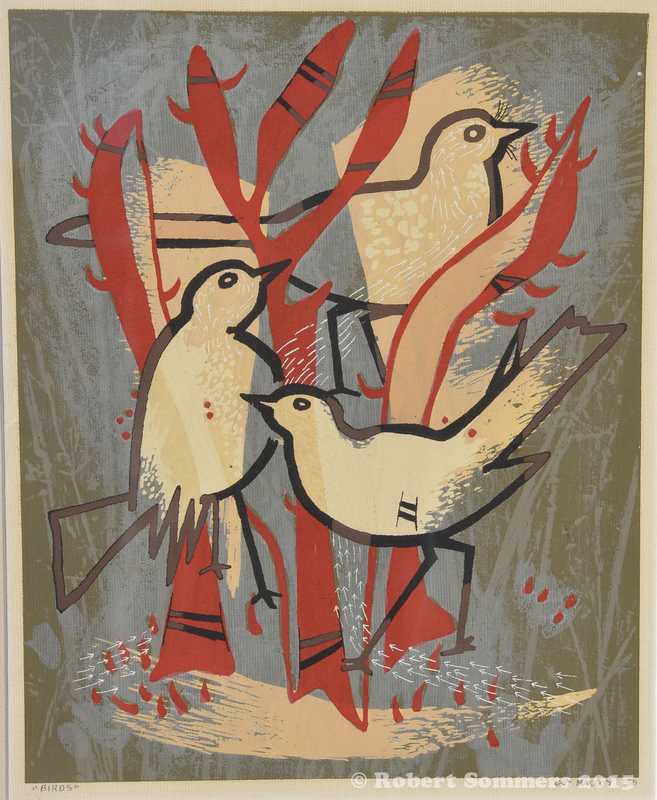 Guy Maccoy (1904-1981) Birds serigraph 1950 13.5″ x 11″ image -pencil signed, dated and titled on bottom margin, framed, sold. This turns out to be a very rare print, not familiar to the estate’s curator. it could be an exceedingly small edition. Studied: Kansas City AI; ASL; Broadmoor A. Acad. ; & with Thomas Benton, Ernest Lawsuit, Jan Matulka, A.J. Kostellow. Exhibited: PAFA Ann., 1933; Kansas City AI 1937-38; WMAA, 1942, 1945-46; Laguna Beach AA, 1943 (prize); AIGA, 1944 (prize); Corcoran Gal. biennial, 1945; CMA, 1946 (prize). Work: Encyclopaedia Britannica Coll. ; NYPL; TMA; Santa Barbara A. Mus. ; Parkersburg FA Center; Univ. Iowa; UCLA; Pepperdine Col.; SFMA; CI; LOC; MMA; Newark Mus. ; PMA; Honolulu Acad. A.; Univ. Minnesota; Philbrook A. Center; Univ. Oklahoma; Oklahoma A &M. Col.; map mural, BM; murals, Brooklyn Indst. H.S. for Girls; First Nat. Bank, Lubbock, Tex. ; Phillips 66 mural, Tulsa, Okla. Comments: A pioneer in the screenprint medium. Position: instr., Jepson AI, Los A. County AI; co-founder-dir., Western Serigraph Inst. Contributor to: Lithographers Journal.Lectures: Serigraphy. Assisted Jorn Tumbo’s production of 23-minute “History of Serigraphy” 16 mm Color film.